Marguerite Elisofon and her husband Howard had boy-girl twins named Samantha and Matthew in 1990. The twins were premature, but Matthew developed normally while Samantha started lagging behind from an early age. After many rounds of testing, Samantha was diagnosed on the autism spectrum, which changed the Elisofons’ lives in every possible way. 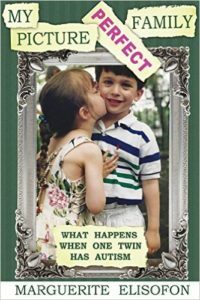 My Picture Perfect Family is a painstaking account of how the Elisofons – and particularly Marguerite – learned to accept that Samantha would never be the “picture perfect” daughter they had hoped for, and how they worked tirelessly to enroll her in programs and schools that would allow her to learn and even thrive. Marguerite’s patience and persistence saw Samantha through several New York City schools until she finally ended up at one that was committed to her intellectual growth. There are many ups and downs along the way: schools that decided that Samantha was too much for them, endless tantrums and disastrous family vacations, punctuated by small steps forward, unexpected breakthroughs and some surprisingly positive playdates. Through it all, Elisofon never gave up hope that her daughter would find a place that would encourage her and allow her to pursue the activities she loved – acting and singing. As a mother of twins myself, I was particularly interested in how Samantha and Matthew related to each other over the years, and how Elisofon navigated balancing of attention between the two, even when one twin needed so much more intervention and involvement. She includes family photographs along the way, along with the backstory of what was happening that the camera didn’t capture. My Picture Perfect Family is a dense, engrossing read. While it is quite detailed, it is never tedious. Elisofon is a skilled writer, laying out the complications in Samantha’s condition and treatment. And it ends on a hopeful note. Samantha graduates from high school and, like her brother, goes on to college. The book ends as she leaves for college, with only a brief epilogue talking about the years that followed. I am glad I read My Picture Perfect Family. It’s a very poignant and powerful look at the challenges of raising an autistic child and the power of a stubborn, persistent parent who wants nothing more than her daughter to be happy and challenged. Whoa. Two weeks since my last post! Not good. My kids are back in school and I’ve been up late at night doing other stuff, I guess. I am halfway through two books – My Sunshine Away and Did You Ever Have A Family, so expect some reviews soon. Meanwhile, I interrupted my adult reading to read our first Mother-Daughter Book Club book of the year: Mockingbird by Kathryn Erskine. This book ended up on our club reading list because it was one of the summer reading recommendations from my daughters’ school. Mockingbird is about an 11 year-old girl, Caitlyn, who has Asperger’s Syndrome. Her beloved older brother Devon was killed in a school shooting, and her father, a widower, is deep in his own grief. Caitlyn is trying to process what happened to her brother and make it through the 5th grade with her limited emotional vocabulary, without a whole lot of support. Mockingbird is a good middle-grade introduction to Asperger’s and spectrum disorders. Caitlyn’s syndrome manifests in a number of ways: she is extremely literal, she has trouble reading other people’s emotions through body language, she’s not empathetic, she hates loud noises and finds colors “messy”, and she likes memorization and definitions. Caitlyn’s school counselor spends a lot of time trying to get Caitlyn to make friends and understand how others are feeling. Over the course of the book, Caitlyn makes some progress on these fronts, and she and her father begin to connect and share in their grief. Our book club conversation ended up changing my feelings about the book. One of the moms/daughters in our club has a family member with autism, and they explained that the book oversimplified several components of spectrum disorder and didn’t give an accurate picture of what someone with autism is really like. They took issue with some of the therapies Caitlyn’s counselor used to help her understand other people’s emotions, finding them patronizing and insulting. To be fair, Caitlyn has Asperger’s, which is high-functioning autism, and the author has a daughter with Asperger’s so she was clearly basing the character on her real-life experience. But my friend’s and her daughter’s reactions did color my view of the book. Also, I was bothered by the way that Caitlyn’s guidance counselor kept trying to “fix”or change her, rather than accepting Caitlyn for who she was and helping her navigate the world as Caitlyn. The girls found Mockingbird to be very sad. They felt sorry for Caitlyn and her father, and were touched by the friendship Caitlyn developed with a younger boy who had also lost a family member in the same shooting. The book was appropriate for 5th-6th grade and held their attention. I found it very sad and compelling as I was reading it, but took issue with the end goal, which was to “fix” Caitlyn rather than work within her limitations. Eli Gottlieb’s new novel Best Boy is told from the perspective of a 50-something autistic man named Todd. The elder statesman of his residential facility, Todd was institutionalized from a young age due to his developmental challenges. He’s highly functioning, but has many of the hallmarks of autism: he can’t process certain sensory inputs, he finds great comfort in routine, he’s not empathetic or good at interpreting others’ social cues and his emotional understanding of the world is very limited. But Gottlieb’s door into Todd’s mind reveals a heartbreaking sadness that helps develop an emotional connection between him and the reader. Best Boy opens with Todd’s routine at the Payton Living Center. That routine is almost immediately disrupted by the arrival of Mike, a new hire at the facility whom Todd immediately dislikes. Mike is menacing, reminding Todd of the abusive father who beat and berated him as a child. Yet Mike won’t leave Todd alone, choosing Todd to help cover for him while he goes off and has liaisons with patients. While Mike terrorizes Todd’s thoughts, a new arrival, the one-eyed Martine, intrigues him. Todd hopes that Martine might be the girlfriend he has always wanted, and is willing to follow her advice and stop taking his meds. Off the Risperdal, Todd gains some clarity, but as the edges of his anxiety become sharper, he grows more restless and unhappy. Amid this discomfort, Todd’s younger brother – who also abused him as a child – arrives for a long overdue visit. Nate’s visit, combined with Todd’s anxiety about Mike and his newly-gained unmedicated clarity, set in motion the second half of Best Boy, where Todd earns a long-desired visit home and a reconnection with his beloved late mother, Momma. I really enjoyed Best Boy. Despite the confines of Todd’s limited emotional articulation, Gottlieb expertly conveys Todd’s innocence and sadness. He also gives a moving glimpse into how autistic minds work, revealing a logic that is often dismissed or misunderstood. And while some characters, like Todd’s awful father, evil Mike and saintly facility aide Raykene tend toward the one-dimensional, others are given more nuance and complexity. Todd’s brother Nate hasn’t always treated him well (and was in fact abusive as a kid), but through Todd’s narration, Gottlieb make him more sympathetic as Best Boy goes on. And we hear from Todd’s beloved late mother Momma at the end, which I found to be the most poignant part of the book. She treasured and adored him, which sustains Todd throughout his whole life. I highly recommend Best Boy. It’s a beautifully told story, and also a valuable and, I predict, memorable look at autism and what it’s like to live in the confines of that world. Edited to add links to 2 articles: one is in the NYT by Eli Gottlieb about adult autism and his experience with an older brother with autism, and one is an interview in BookPage about the writing of Best Boy. The Curious Incident of the Dog in the Night-Time, by Mark Haddon, is a story told through the eyes of Christopher Boone, a teenager with autism who discovers his neighbor's dog dead one evening. He decides to write a book about the mystery behind the dog's death, using Sherlock Holmes (one of his favorite characters) as a model. The Curious Incident of the Dog in the Night-Time is nominally about Christopher's attempts to solve the mystery of the dog's murder, but his investigation leads him to much larger discoveries about his parents and their relationship with each other, and him. Haddon narrates this book through Christopher's voice, which gives remarkable insight into the autistic mind. The story is told very literally and in a matter-of-fact tone, but the chapters advancing the plot are interpersed with ones about math, geography, biology, vocabulary and other topics that soothe and comfort Christopher's oversensitive brain. He has many patterns typical of autistic kids: he only eats foods of particular colors, he cannot stand to be touched, he is frightened of places and people he doesn't know, and he cannot process too many sensations at one time. Most notably, Christopher is incapable of empathy. He cannot relate to what others might be feeling or how his actions may affect them, particulary his parents. He is in touch with his own feelings of anxiety, fear, or even pride, but he cannot seem to feel love or affection for other people. [N]o one is going to talk to me or touch me or ask me a question. But if I don't want want to go anywhere I don't have to, and I can stay at home and eat broccoli and oranges and licorice laces all the time, or I can play computer games for a whole week, or I can just sit in the corner of the room and rub a coin back and forth over the ripple shapes on the surface of the radiator. Christopher's greatest joys in life do not have to do with other people, but with activities that he finds reassuring or comforting, or in contemplating difficult scientific and philosophical problems. Haddon beautifully paints the difficulties his parents face in raising him, and why their relationship fell apart. I listened to most of The Curious Incident of the Dog in the Night-Time on audiobook. While the narrator was excellent, I recommend reading over listening to this book. The print version is filled with diagrams, drawings, equations, symbols, and even handwriting, which the listener misses out on. Also, when Christopher's mind goes into overdrive, or he tries to explain something complicated, it's easy to get distracted. This is a very good book – highly recommended.